Guns: VFC Colt M4, CyberGun CO2 SigSauer P226 E2, StarkArms S17 CO2. Loadouts: BA Mk6 Kevlar Helmet, BA MTP uniform, Tac-vest, 4 Stanag, 2 S17 mags, Radio, Hiking boots. I'm sure many of us have been temped by one these beautiful Kydex pistol holsters, but just as many probably have been put off by the non-negligible prices. Well at the very least it is what I experienced. One thing kept bugging me, however. 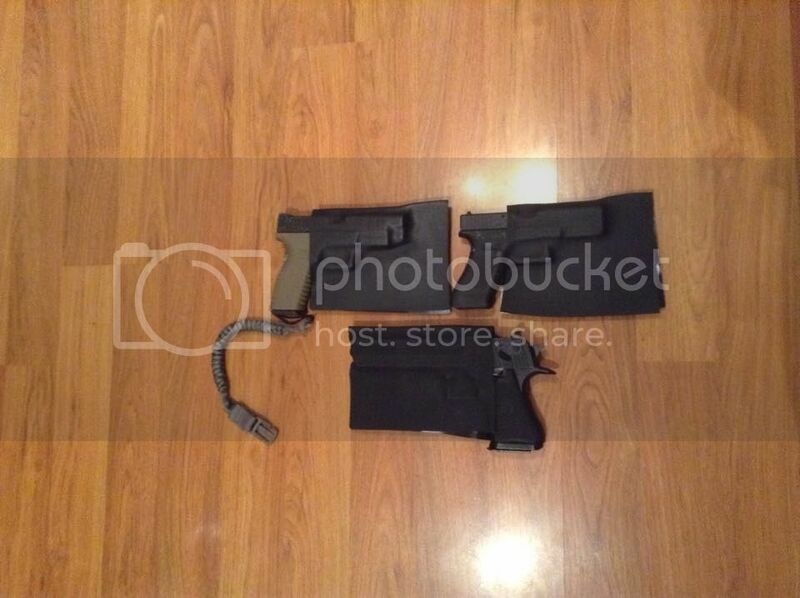 How come a "plastic" holster like that costs so much, surely putting it together isn't that expensive. 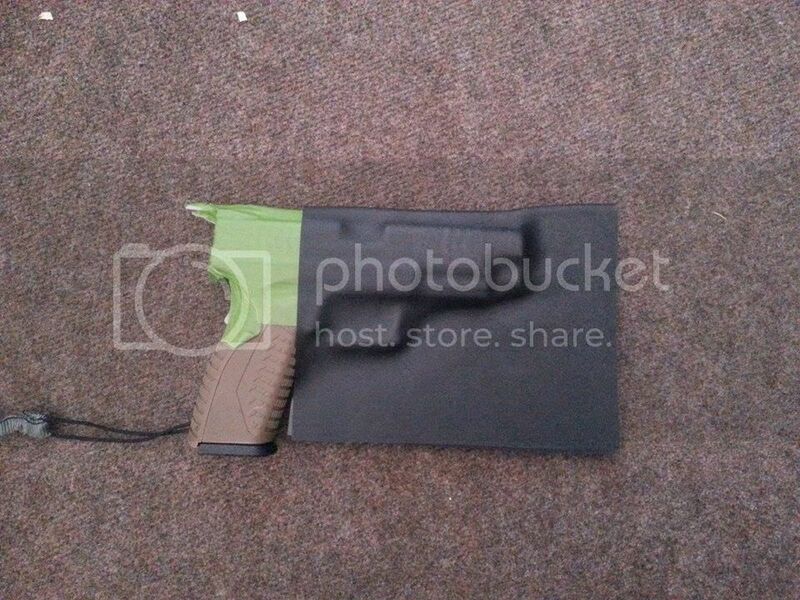 So I went on the internet to look up what these holster were made of; well unsurprisingly they were made out of Kydex - a thermoplastic material (it can be modelled by applying heat) - but surprisingly enough the Kydex itself is widely available and quite cheap. I immediately thought to myself: "How do I go about making one of these holsters myself?" 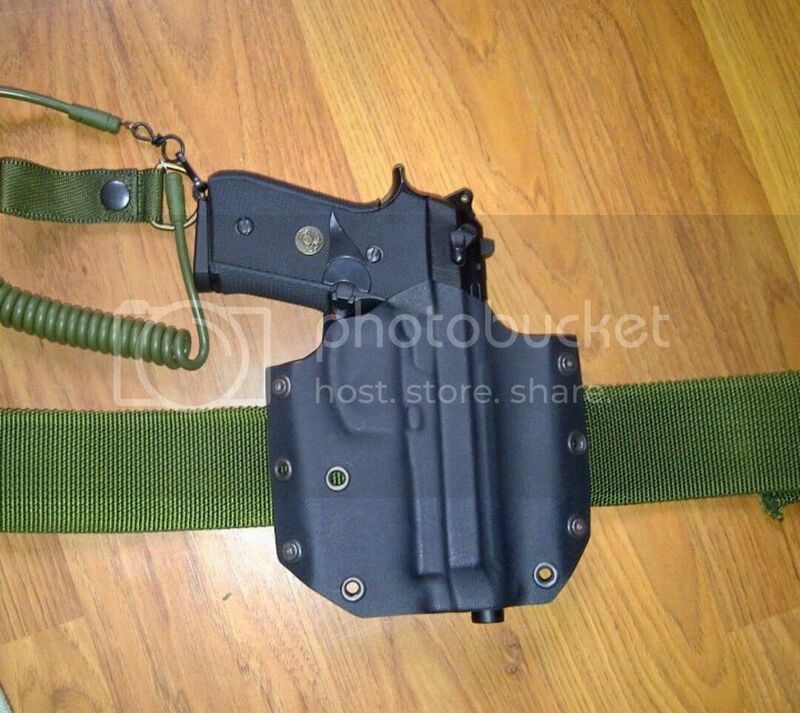 So I headed on Youtube and long story short it looked like you needed a hell of a lot of expensive machinery and tools to craft one of these holsters, and I'm talking belt sanders, heat treatment oven, drill press, rivet gun, press and so on. However, all of these fancy tools - of which I had none - didn't discourage me and I thought, this thing is quite cheap so why not give it a shot anyway? 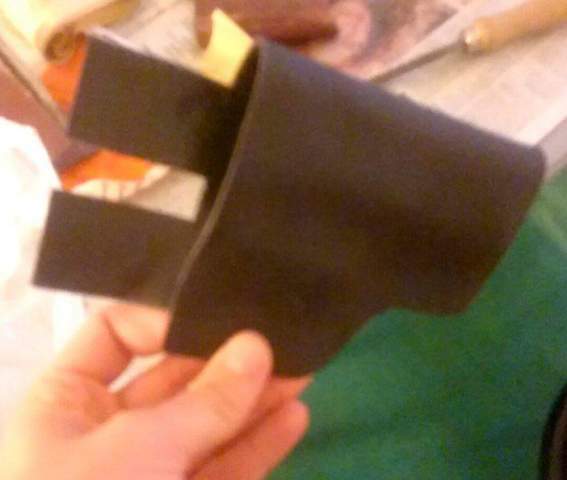 So here is the story of how I managed to make my first Kydex Holster with almost no tools at all. For only a few pounds. 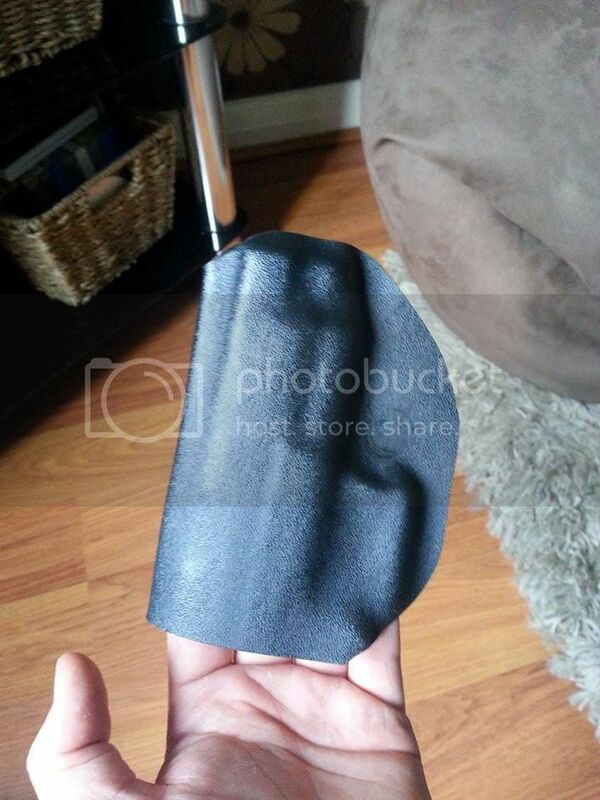 First thing you'll need is a Kydex sheet, these are widely available in the UK - ebay will be a good place to get some - bear in mind when ordering some Kydex that you don't want to order a really thin sheet as it'll just break, the one I got was roughly 2mm thick. And...that's about it really, you might find it easier if you have a hand-held drill and a cheap rivet gun but you can do without. Once you got your Kydex sheet you'll simply have to draw on it the shape of your holster, use your gun to give you a rough idea of the outlines, and remember to leave plenty of excess material - you can always remove material later but you can't add material back. Now, most "professional" Kydex holsters use proper belt loops to secure on your belt but I simply left out two strips of material coming out of the holster that I later bended to make the belt loops. You might be thinking: "What the hell is he even talking about?" and to be fair you'd probably be right, if you check the video at the end of this post you'll know what I mean! When your drawing is done you'll have to cut it out, scissors are good enough, you'll need a cutter or something like that. If your design is done now your next step is to heat up the Kydex. Your home oven should do the trick. Pre-heat at 175° (more or less) and once it's ready put your Kydex on a tray and shove the tray in the oven (make sure you put the Kydex smooth side down). Don't go anywhere yet, you need to keep a sharp eye on that, it'll "cook" quickly. It'll take the Kydex roughly one or two minutes to reach the moulding temperature, if you see an edge starting to fold up it means it's good to go so take it out quickly. Here's the part where you have to act fast, ideally you have a foam press but I didn't so I made it happen with whatever I could find that was close enough to a press....two pillows. 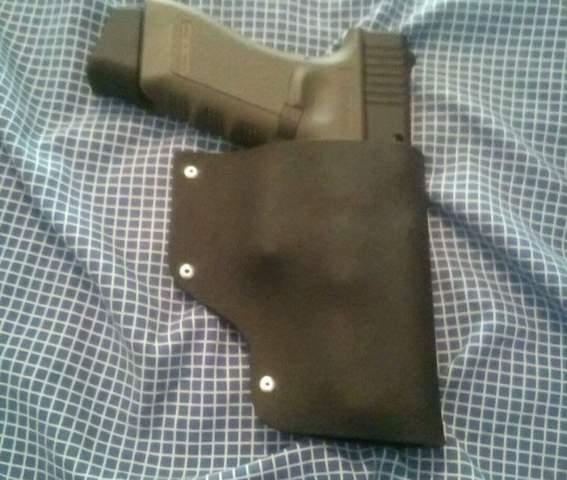 Wrap the Kydex around your gun, that's how it'll make the shape of your holster, and don't bother too much with matching the edges you can sand them later, just make sure it's wrapped around tightly. Immediately put your Kydex and gun in the press, or as I did it - put it in-between two pillows and place a few dozens books (or anything really heavy) on top of the pillows. Basically you're making a sandwich, your pillows are the buns, your gun is the burger, your Kydex is the cheese dribbling around the meat and your books are the sesame seeds on top of your bun. You're going to want to leave the Kydex under there for 10-15 minutes, basically the Kydex has to cool down completely or it will return to it's original shape. If you want to you can sit on top of the whole thing while it's cooling. 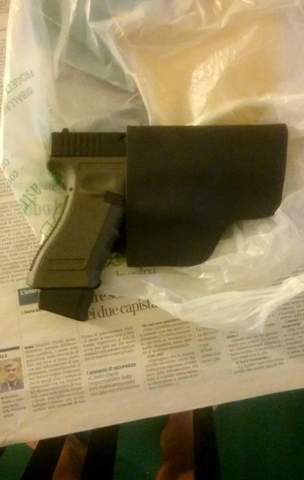 Two tips, if you don't want to burn your pillows put a tin foil sheet in-between pillows and Kydex, if you don't want to burn your hands use gloves and if you don't want to damage your pistol then put an empty magazine in the pistol. Once it's cooled down you're halfway done! Get yourself a piece of sandpaper and sand down every excess materials on your new holster, make the edges match and smooth out all of the edges. If like me you made belt loops out of Kydex heat them using your gas or electric cooker and bend them the way you want. Make sure you don't touch the cooker with your Kydex and that you only apply heat to the parts you want to change (if you still have no idea what I'm talking about check the video below). Next is the easiest bit, get your drill, make two or three holes along the edges, and tie up the two halves with rivets. I simply got myself a cheap rivet gun and put in three rivet but I'm sure you can use something else than rivets and I'm also sure you can make three holes with something else than a drill too! That's it, you're done, your marvellous Kydex holster is finished. It fits perfectly your gun, offers fast draws and retains perfectly. No? Did you screw up? Well the good thing about Kydex is that you can heat is back up two or three times and mould it again so don't worry too much! Again, you do not necessarily need all the tools he used. I had none. Use your imagination! Hopefully you found this post interesting/informative and I wish you luck in attempting yourself! PS: I do not take responsibility for any house fire/skin burns resulting from following this post. You do so at your own risk And never leave hot things unattended! I'm sure you could mount it on your leg drop panel, either by bolting it into place (rivets maybe?) or you could come up with some kind of attach/detach system. I'm personally not a fan of drop leg holsters, mine used to wiggle around while I was running and it became quite annoying. You should go for it though! Overall, it took me maybe four hours over two days and that's without having any of the "proper" tools for the job! Obviously you're not using a press then ? there's no shape to your holsters at all. Do they actually have any retention ? If so where is the retention coming from because i can't see where it would be looking at your pictures. I make them and use a home made press along with some other bits so once they come out i can simply drill the holes for the mounting screws and done. As an example, here's some of mine in progress. They have shape and you can roughly have an idea of where the retention will be coming from. Below is two completed products. Yeah I'm not using a press and the shape isn't as good as I would have liked it to be. However the retention is perfect. I can flip the holster around and wiggle it, or try and throw out the gun but it doesn't move at all. Yet drawing is really fast and easy. I'd say that the retention comes mainly from the trigger guard, the slide and the ejection port. Yours do look really nice however, especially the finished one with the beretta 92? I'll definitely be getting a press if I'm making another one!